What will it take to get humans to Mars? That's the question on tap for hundreds of scientists, entrepreneurs, astronauts and government officials descending on Washington, D.C. this week for a summit on manned travel to the Red Planet. Speakers at the second annual "Humans 2 Mars Summit," running May 6-8 at George Washington University, include NASA chief Charles Bolden, Apollo moonwalker Buzz Aldrin, and space tourist Dennis Tito, who recently announced his own plan to send a married couple on a round-trip Mars flyby mission in 2015. The conference is co-sponsored by the Space Policy Institute at George Washington and the non-profit Explore Mars organization, which aims to advance the goal of sending people to the Red Planet within the next two decades. Panels at the meeting this week will examine the challenges — scientific, technological, and political — of manned Mars exploration. Among the topics to be discussed are Mars agriculture and food production, propulsion and landing technologies, and spacesuit design and life support systems. "Our goal for the summit is to not only address the challenges of humans going to Mars but also to propose real solutions," Explore Mars executive director Chris Carberry said in a statement. "With the collaboration of experts in the space and science communities and non-traditional players, we will come out of the summit enlightened, encouraged and ready to plan for a human mission to Mars by 2030." NASA has said it aims to send astronauts to Mars by the mid 2030s. The space agency is building a giant heavy-lift rocket called the Space Launch System and a new crew capsule called Orion to take people beyond low-Earth orbit. Private companies and non-profits are also aiming for Mars. In addition to Tito's Inspiration Mars mission, the Netherlands-based nonprofit Mars One foundation recently announced that it is seeking astronauts for one-way Mars missions to establish a colony on the Red Planet starting in 2023. Mars One co-founder Bas Lansdorp will speak at the conference as well. Registration for the conference is open to the public, and the event will be broadcast live online. You can watch the manned Mars mission webcasts on SPACE.com beginning at 9 a.m. ET (1300 GMT), courtesy of the summit's webcast. You can also follow the webcasts directly here: http://h2m.exploremars.org/webcast/. 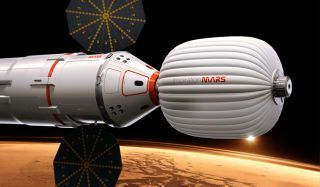 Visit SPACE.com this week for complete coverage from the Humans 2 Mars Summit in Washington.